GOLD Lashing OUT: Holding STRONG! Working with reality is one of the most fundamental elements of successful investing, yet this continues to be the biggest stumbling block for most. The best-performing mutual fund for the decade of the 2000s made 18% annually. That’s close to Warren Buffett’s level of excellence (19.3%). The average investor in the fund, though, LOST 8% annually during the same period. Instead of allowing the fund managers to execute trades using their skills, while holding, the clients bought and sold, according to their own whims, influenced profoundly by their emotions. Remember, 94% of individual investors do not READ even one investment book a year. This would be the equivalent of an NBA basketball player training once a month and then trying to become an all-star – it doesn’t work that way. This major revelation about the immense impact of short-term fear and overwhelming greed on the opposite end is yours to overcome and use to your advantage. In fact, billionaire investors have reached that level because of their ability to recognize panics and seize the bargains they present, or to recognize manias and avoid them, in most cases. The same holds true in the gold sector, of course. It is even more visible in the tiny silver sector. Investors go from extreme hatred of precious metals, deeming them part of economic history or nothing more than lumps of minerals, which do not yield income and simply take-up room, but have no utility. To the other extreme, they see them as pure money, the ultimate safe haven, a MUST for sophisticated investing, and an important hedge against catastrophes. The pendulum swing between hot and cold, love and hate, is what provides us with buying and selling opportunities. There are two fundamental forces at play with precious metals at the moment. 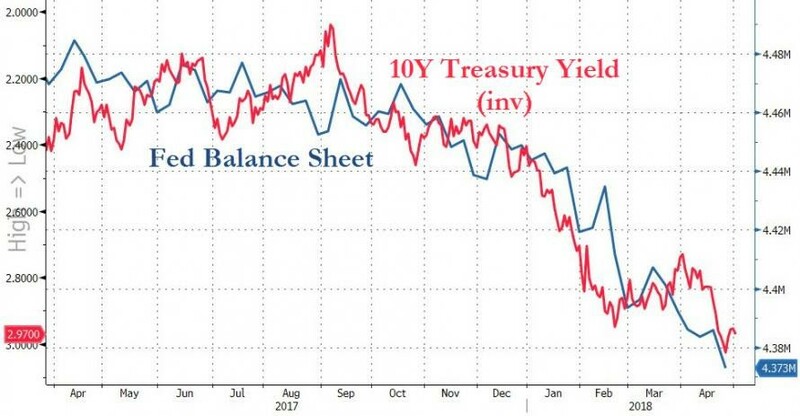 As you can see, the FED balance sheet reduction (the tightening) is causing rates for Treasuries to rise sharply. At some point, this perfect correlation will decouple, as the FED continues to “normalize,” yet rates succumb to competitive forces. Rates cannot rise too sharply. The FED is convinced it has avoided inflation altogether, has contained it, and will proceed with managing interest rates, flawlessly. The market seems to agree, for now. It does not love on gold right now. 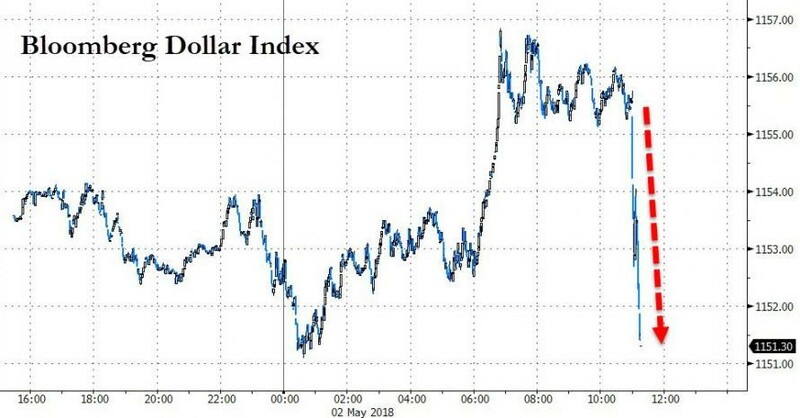 In fact, the market is buying USD in droves. Instead of fighting reality and sticking with opinions that are not profitable, we must zig and zag, never allowing our own bias to corrupt our judgement, using our knowledge to our advantage. If you do not own any physical precious metals, at $1,300, gold is a steal compared to $1,350 just two weeks ago. If you have sufficient amounts, then staying in cash makes sense because stocks usually become cheaper, as the USD appreciates, which will provide us with opportunities in a number of weeks. Here’s how you should think about this – in tennis, there are professionals, and there are amateurs. The amateurs make countless mistakes. They hit the net frequently, hit the ball out of court boundaries every few shots, and are prone to unforced errors. The aggressive amateur is the biggest loser. He fails to comprehend his weaknesses; therefore, others take advantage of him. The same process happens in the markets. The newbies are prone to make costly mistakes when being greedy, and the professionals punish them. The best amateur is concerned mostly with avoiding mistakes. He keeps hitting back balls to his opponent, waiting for him to become greedy and hit a “fancy” shot and miss. The professionals, though, are killers. They hardly miss shots. They can make the ball do practically anything they want. To beat them, you need to become a shark, aggressively attacking at every opportunity. Don’t go for the kill every time. Pick your battles. If you are unsure, wait; let the opportunity come to you. There are millions of amateurs out there. Let them, just like the clients of the mutual funds above, who managed to lose money with the best-performing managers for an ENTIRE DECADE, fall into error, by surrendering to their primal emotions, while you stay logical and calculated. Doing the right thing in the markets is most often the hardest, which is why you want to be in the minority that does it. Gold and the USD are both fighting for buyers. The battle will determine how financial assets behave. Let amateurs take the market to an extreme and then act, accordingly. TROUBLING: Many Will NOT Survive The CRISIS!